Of all the things that could be said to a judge when you've been arrested? His clothes and his bed should be the least of is immediate worries. Makes me wonder where his mind is/was? "Sir I have a question for you. Like, they took all my clothes and they got me sleeping on a hard thing. I should be able to have some kind of clothes." It didn't dawn on me until others commented on the articles about it, but now I too think he may have been naked in his cell? If so, that makes his requests more understandable IMO. Maybe they thought he was suicidal? “You appear to me to be dressed in a jump suit,'” the judge replies. “Well, once I get back there I’m gonna take my jumpsuit off and tell me I can take my jumpsuit,” Matthew said. MOORE: Well, in my opinion and this is like coming from like a lifetime childhood friend, Jesse is not the kind that is like easily -- to be under pressure. Michael, do you know him to have a physical ailment? Why would he be in sick bay, medical bay in the -- in the jail? Could he have drugged her? The below statement of Moore's caught my attention. I'd like to know more about the roommates, and the live-in girlfriend mentioned by his grandmother. As police gathered additional evidence Monday, roommates of the prime person of interest in the disappearance of second year Uva student Hannah Graham, moved out of the apartment they shared. Matthew’s landlady, Francies Lee-Vandell said her relationship with Matthew wasn’t always pleasant, but something changed when she talked to him last week. She said that she thought he was on his way up after just getting promoted as a nursing assistant at the University of Virginia Medical Center. Now she questioned how well she actually knew Matthew. “I don’t know how to recognize a problem, and I feel very sorry that I can’t pick up on things like that,” said Lee-Vandell. Monday, police executed two new search warrants at Matthew's apartment on Hessian Hills Way and removed three bags of evidence. His landlord, Frances Lee-Vandell, said two other roommates moved out Monday and she hasn't heard from Matthew since Thursday, the night before the first police raid of his apartment. "He was unusual with me Thursday night," she said. "He was very nice and trying to do everything helpful. I found it unusual." ‘I practically raised LJ,' Mrs Carr added. 'His mom was working and I looked after him and his sister, Nicky. I believe all prisoners are processed through medical. It doesn't necessarily mean he's ill. Also, sometimes putting them in the medical area is a way of segregating them from other prisons. 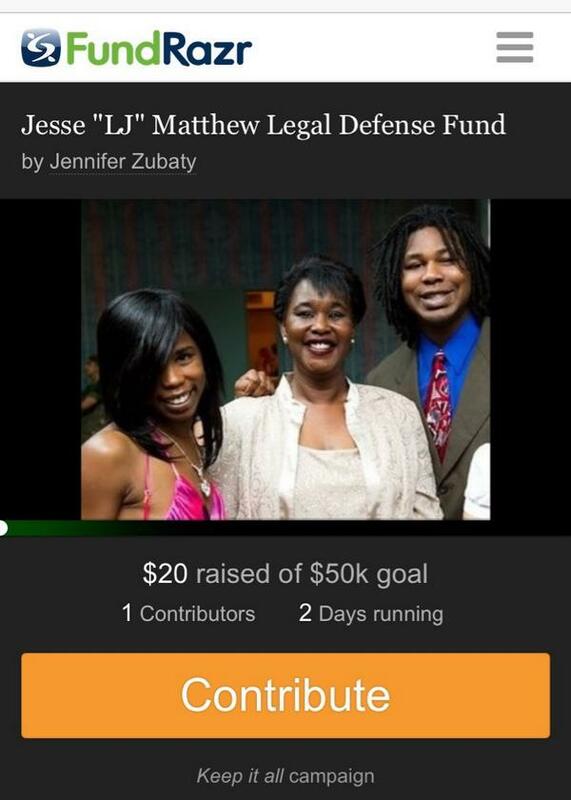 #JesseMatthew is in “administrative segregation,” meaning they are watching his behavior. Make sure he is secure from other prisoners, self. In never took JM's comments about them taking his clothing as meaning he was kept in the cell naked. I took it to mean he didn't care for the prison jumpsuit. But I don't really know... Here is the article that has convo between JM and the judge. The suspect in the disappearance of a University of Virginia student went before a Galveston County judge early Thursday morning a day after his arrest. Jesse Leroy Matthew Jr., 32, wearing green jail-issue coveralls, waived his right to an attorney at a hearing inside the county jail before Galveston County Judge Mark Henry, who occasionally takes time away from his duties at Commissioners Court to assist the magistrate judge. The arraignment took place behind locked doors and could be viewed by the public on a video screen in the jail lobby. Henry denied him bail on the charge from Virginia and set a $1,500 bond on a Galveston County charge of giving false information to a police officer. Bail is typically denied for a number of reasons, including a defendant being a flight risk. "And sir I have a question for you," Matthew asked Henry. "Like, they took all my clothes and they got me sleeping on a hard thing. I should be able to have some kind of clothes." Henry said, "You appear to be dressed to me." Matthew said, "Once I get back I'd rather take my jumpsuit off." Henry told him to take it up with the sheriff's office. 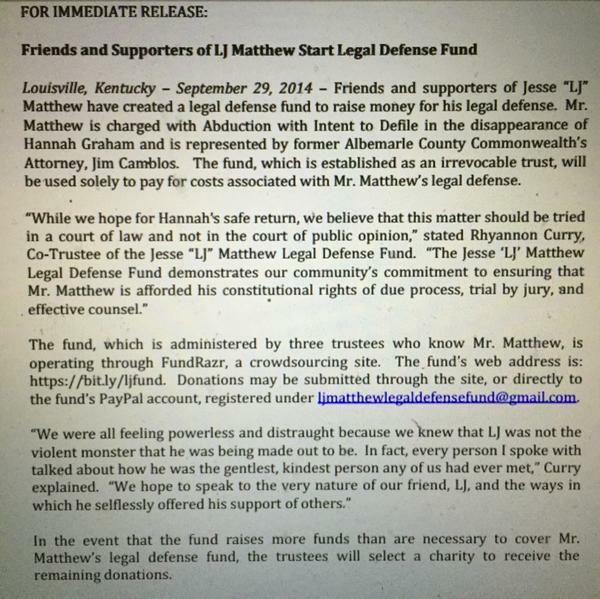 By his action Thursday morning, Matthew is indicating he will not fight extradition back to Virginia. Matthew was wanted in the kidnapping of 18-year-old Hannah Elizabeth Graham, a case that has made national headlines and roiled the college town of Charlottesville, Va.
A Galveston County deputy apprehended Matthew about 3:30 p.m. Wednesday in Gilchrist, a small community on the Bolivar Peninsula - 30 miles of beachfront marked by tiny hamlets and resort areas that are still recovering from 2008 Hurricane Ike devastation. Galveston County Sheriff Henry Trochesset said that Deputy Ross Perez discovered Matthew on the Bolivar Peninsula living in a tent on the beach. He said Matthew's car was parked nearby. "It was a job well done on all counts," he said. It was unknown how long he had been on the peninsula. Virginia officials and the FBI have asked the sheriff's office to refrain from revealing details about the arrest, Trochesset said. Matthew's car has been impounded, he said. Law enforcement officials from Virginia are expected to arrive in Galveston Thursday afternoon. Matthew will be processed through the Galveston County jail, then extradited to Virginia, the sheriff said. 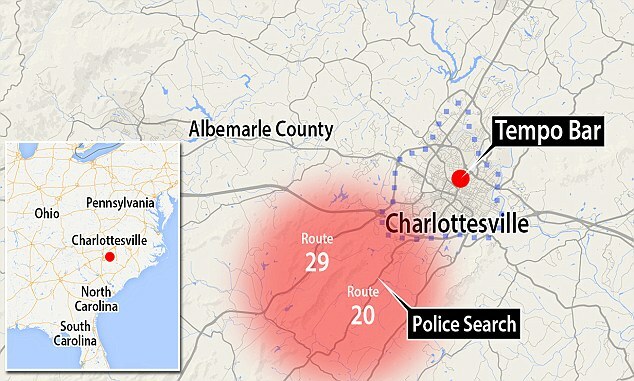 During a news conference Wednesday night in Virginia, Charlottesville Police Chief Timothy Longo said the search for the missing student is continuing. After reading different quotes in different articles I figured it might be best to listen for myself. From my understanding after listening the quote in this article is not correct or complete and that makes it sort of misleading imo. From my understanding after the judge says it looks like he has a jumpsuit on; he says "well once I get back they're gonna take my jumpsuit off...and tell me I can take my jumpsuit off." And then they discuss when he can get the jumpsuit back. There are two problems with the image that was tweeted. 2.) There is a confusion here as to whose offense is whose. His father, or him. See the DOB below for the offense: 5-30-****. Jr's DOB is 12-14-1981. I believe the referenced offense is his father's, not his. Also, this just shows the Charlottesville court system offenses, there are quite a few through the Albermarle court system as well. Seems like both of them, father and son have racked up quite a few traffic offenses. Hope this helps and sorry for the huge images, but they were not very readable when I reduced the size. Students at the University of Virginia continue to show their love and support for missing second-year student, Hannah Graham, by wearing orange "Hope for Hannah" ribbons. Since Hannah vanished more than two weeks ago, there has been a renewed interest and concern from students about the safety of UVA. University administrators have done several important things to insure the campus continues to feel like a home away from home for students. Abraham Axler, president of Graham's class, says that while many students may be a little uneasy, they are not scared. Last week the University announced an increase of campus patrols and more assistance from local law enforcement. They also expanded the number of vans and hours for their SafeRide program. "I've definitely seen a lot more cops around and I think that is good because there wasn't really much of a presence before so I really appreciate their efforts," said Michelle Farggert, a third-year student. Since the disappearance of Graham, students say they have noticed the increased security presence. "We do notice it and they do seem to be well doing their jobs," said third-year student Ashlye Allison. RE: the developmentally delayed or disabled possibility -- I know someone who is said to be DD and even draws a disability income. But that someone is strangely perfectly able to make decisions when it is of benefit to her and to sway matters in her favor through manipulation, mainly using her disability as leverage. So, I'd venture to say she is not that delayed. Nothing against anyone who is in fact DD. Just my observations about one person. JM -- he might not be highly intelligent or organized, but the "slowness" might also be an act or a possible defense strategy. I believe "luck" has been on his side until now. I always thought once they had Morgan's perp's DNA and linked it to another crime and a sketch, it was a clock ticking very loudly. Time seems to be running out. Is it running out for JM? Tick tock. We shall see. From this map, it looks like (and I'm hoping) they are covering area now in the search that will include the Ponderosa Trail address that JM listed when he was cab driving, and the area where Morgan Harrington's remains were found about six miles away. Praying today is the day that Hannah is found! Prayers for her precious family. I know the waiting is excruciating! HANNAH GRAHAM BREAKING: Forensics collected from Jesse Matthew linked to Morgan Harrington.